Please don’t use this script to change the local Administrator password. That’s very helpful for administrators since it provides an automated mechanism for what previously required a custom solution such as a script. 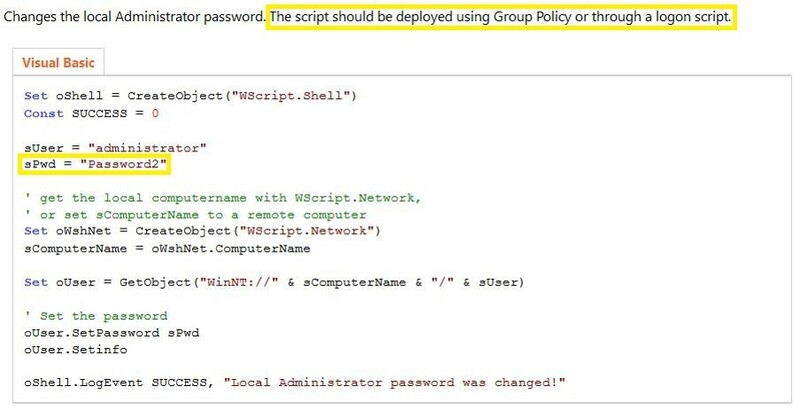 It provides useful capability to leverage Group Policy to “deploy” scheduled tasks with explicit credentials and change the local admin passwords on large numbers of computers at once – probably the two most popular usage scenario. The question at this point should be: how is the credential data protected? Except at some point prior to 2012, Microsoft published the AES private key on MSDN which can be used to decrypt the password. Since authenticated users (any domain user or users in a trusted domain) have read access to SYSVOL, anyone in the domain can search the SYSVOL share for XML files containing “cpassword” which is the value that contains the AES encrypted password. With access to this XML file, the attacker can use the AES private key to decrypt the GPP password. The PowerSploit function Get-GPPPassword is most useful for Group Policy Preference exploitation. The screenshot here shows a similar PowerShell function encrypting the GPP password from an XML file found in SYSVOL. From what I can find, the issues with GPP credentials was first written about by Emilien Gauralt in the post “Exploiting Windows 2008 Group Policy Preferences” in January 2012. Unfortunately the link is dead and the content offline. A few months later in May, Chris Campbell – wrote the article “GPP Password Retrieval with PowerShell” as well as the first PowerShell code to exploit this issue. Chris later updated the PowerShell code and added Get-GPPPassword to PowerSploit. About a month later, in June, “Rewt dance” posted a GPP exploitation expanded reference (link offline – google cached version). I also recently discovered Alexandre Herzog’s post “Exploit credentials stored in Windows Group Policy Preferences” (dated April 2012). I have written about the problems with credentials in Group Policy Preferences and the GPP patch (KB2962486). I continue to find administrative credentials (including Domain Admin credentials) in Group Policy Preference XML files in SYSVOL, especially for scheduled tasks running under the context of admin accounts. The obvious question for defenders is how to protect against this? Microsoft released a patch in May 13, 2014 : “MS14-025 Vulnerability in GPP could allow elevation of privilege” (KB2962486). This patch needs to be installed on all systems that administer Group Policy using the Remote Server Administration Tools (RSAT). 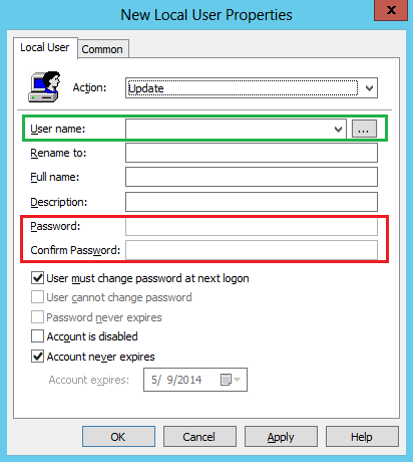 This patch prevents admins from putting password data into a Group Policy Preference. Place a new xml file in SYSVOL & set Everyone:Deny. Sing the associated GPO doesn’t exist, there’s no legitimate reason for access. Install KB2962486 on every computer used to manage GPOs which prevents new credentials from being placed in Group Policy Preferences. Delete existing GPP xml files in SYSVOL containing passwords. The best Microsoft provided method for changing local Administrator passwords is the “Local Administrator Password Solution” aka LAPS. How would one decrypt the cpassword string using the MS AES key? Using the PowerShell function Get-GPPPassword in PowerSploit which I link to. Set the $cpassword variable to the cpassword field value. Does the Get-GPPPassword function need to be run on the same domain? Our users are prevented from editing the Modules available in PowerShell so PowerSploit is not usable. If the policies were copied outside of the VM to a local machine able to run PowerSploit, would the Get-GPPPassword function work? It can be run against any trusted domain. The key point is that no “hacking tool” is required. Open Windows explorer and open the Policies folder in SYSVOL and search for *.xml. Open up the results with the names I listed in the post (groups.xml, scheduledtasks.xml, etc), and copy the cpassword value. This can be uploaded to the internet somewhere, emailed, etc. Then the PowerShell function I pasted in an earlier comment can be run anywhere. Furthermore, that PowerShell function will decrypt the cpassword attribute without loading any modules so it can be used anywhere.